Little princess is turning four tomorrow. She’s been reminding all of us that ‘My birthday is almost coming’. She’s so grown. She’s so beautiful. When i was just 3 months to the due date, doc said that my baby was not lying in the correct position .Another said the same a month later. We prayed. We prayed that all would go well. It was a miracle that during my last month baby was in the correct position alright. No complications. I remember that interesting morning i had her. Half past 3 in the morning June 12 2006. She coughed and then she cried. She was 3.3kgs. I remember what i thought after i looked at her well manicured little nails and slim shapely fingers. This one..she’s gonna be a beauty freak! How true this has turned out to be. Little miss is fussy about details and loves decorating things…and herself. She sneaks up on me when i go to the shower and applies my lip balm or any other beauty product she can lay her hands on. She loves bling and always notices every time i buy some new bling. She will tell me. “Thach a nice bling”. ? She knows what she wants and goes for it. She is a perfectionist. No grey areas. She loves things done her own way. This makes us be at loggerheads sometimes. But we make up soon enough. 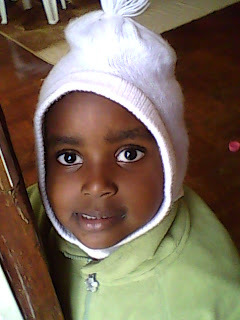 As she turns four, i thank God for the special gift of her. She’s my baby you know…Happy Birthday baby girl! Happy birthday Vanessa!You've grown so big now that you're 4. Betsy, aw! Thats so lovely. Thank you! still reading more of your blogs. may God give you and your daughter more years…..such a beauty Kajune is.